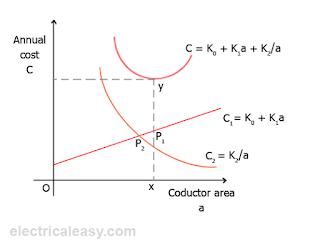 whereas, if the cross-sectional area of the conductor is increased, the line losses decrease but the total capital cost increases. Therefore, it is important to find the most economical size of the conductor. Kelvin's law helps in finding this. 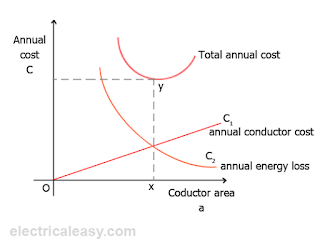 Now, annual interest and depreciation cost is directly proportional to the area of conductor. And, annual running charges are inversely proportional to the area of conductor. Where, K1 and K2 are constants. For C to be minimum, the differentiation of C w.r.t a must be zero. i.e. dC/da = 0. "The Kelvin's law states that the most economical size of a conductor is that for which annual interest and depreciation on the capital cost of the conductor is equal to the annual cost of energy loss." As the annual cost of conductor is directly proportional to size of the conductor, it is shown by the straight line C1 in the figure. Annual cost of energy loss is shown by the curve C2. The total annual cost curve is obtained by adding the curve C1 and C2. 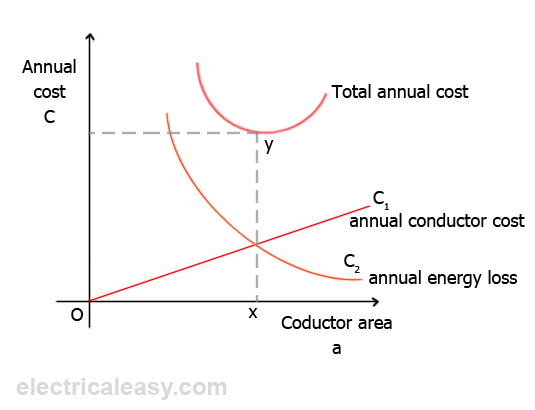 The lowermost point on total annual cost curve gives the most economical size of the conductor which corresponds to the intersection point of curve C1 and C2. 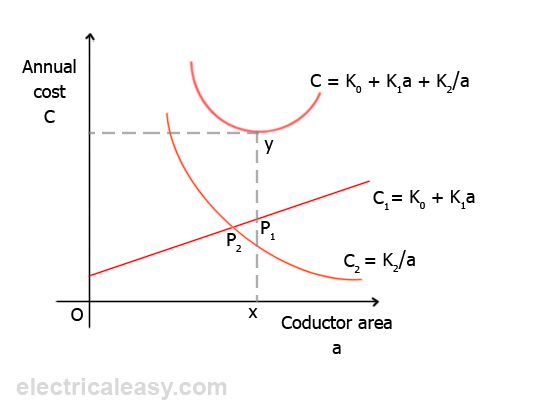 So, here, the most economical area of cross-section of the conductor is represented by ox and the corresponding minimum cost is represented by xy. It is quite difficult to estimate the energy loss in the line without actual load curves which are not available at the time of estimation. Interest and depreciation on the capital cost cannot be determined accurately. The conductor size determined using this law may not always be practicable one because it may not have sufficient mechanical strength. This law does not take into account several factors like safe current carrying capacity, corona loss etc. The economical size of a conductor may cause the voltage drop beyond the acceptable limits. The actual Kelvin's law does not count the cost of supporting structures, erection, insulators etc.. It only accounts for the capital cost of conductor and corresponding interest and depreciation. Also, for underground cables, the cost of insulation and laying is not considered in the actual Kelvin's law. To account for these costs and to get practically fair results, the initial investment needs to be divided into two parts, viz (i) one part which is independent of conductor size and (ii) other part which is directly proportional to the conductor size. For an overhead line, insulator cost is almost constant and the cost of supporting structure and their erection is partly constant and partly proportional to the conductor size. So, according to the modified Kelvin's law, the annual charge on capital outlay is given as, C1 = K0 + K1a. where, K0 is an another constant. The differentiation of total cost C w.r.t. to the area of conductor (a) comes to be same as derived above under the heading Kelvin's law. 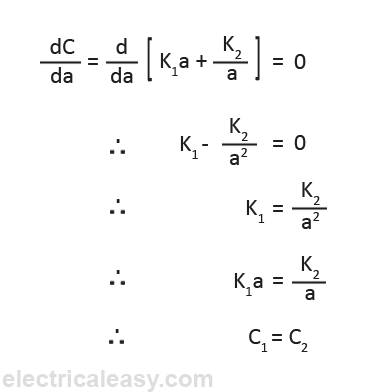 The modified statement of Kelvin's law suggests that the most economical conductor size is that for which the annual cost of energy loss is equal to the annual interest and depreciation for that part of capital cost which is proportional to the conductor size.